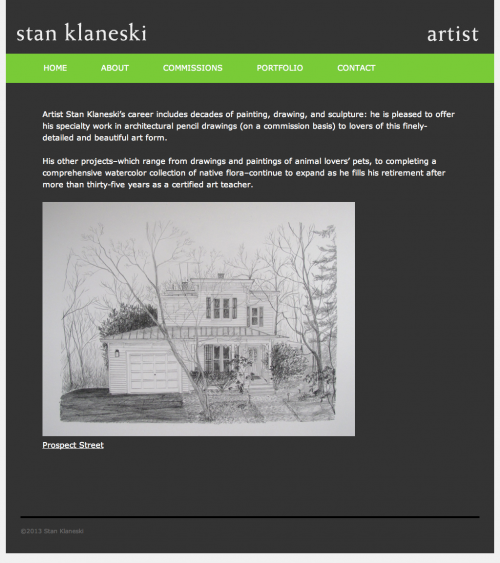 This portfolio website was created for artist Stan Klaneski, a Connecticut artist and retired elementary art teacher who creates beautiful pencil drawings of homes that he calls “house portraits.” His recent work also includes watercolors of flowers, fish, and more. This website was designed to help potential clients be able to see his work and contact him about commissions and purchasing works. Accompanying business cards were created along with this project to match the website and provide an easy way for the artist to advertise his website.